Chicago AXPONA Show is Next Week! Many of you might be wondering what I have been doing over these past few months. Obviously, I haven’t been writing new blog posts and to those readers that miss them and asked what’s up, I’m really sorry. Life HAS been less busy now that the book is finished and has been shipped to all backers and customers (if you purchased a copy and have not received it, please contact me). But somehow everyday still gets filled up. I’m actively promoting the book, still consulting on the YARRA 3DX sound bar (which has raised over $1 Million on KS and IGG), teaching audio at CSUDH, and working on a few side audio projects. 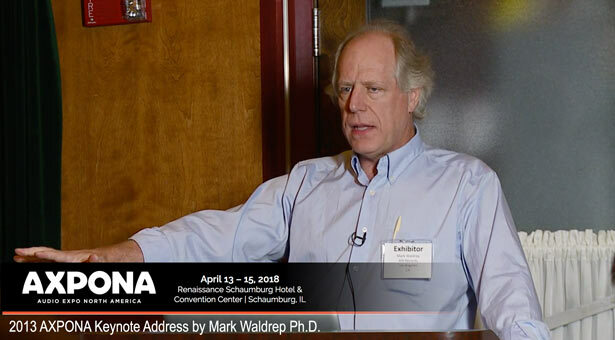 Today’s post is about the upcoming AXPONA show, which starts at the end of next week in Chicago. Unlike previous years, AIX Records will not be demonstrating our high-resolution, 5.1 surround audio/video productions in a large ballroom with our regular partners JVC, Benchmark, Oppo, Emotiva, and DH Labs. Increasing show costs and difficult logistics make it prohibitive. If you’ve had the pleasure of experiencing the incredible system we assembled at past AXPONA shows, consider yourself lucky. It’s unlikely that I’ll be able to pull that off again. I’m sorry that I won’t be able to demonstrate the amazing sound of real high-resolution music. I have genuinely enjoyed the AXPONA show and our little hi-res, 5.1 surround oasis. It’s even difficult to justify sponsoring a single $1000 table in the marketplace. The new corporate approach and new venue means small vendors like me have to pay $100 for an additional table, $168 for an electrical outlet, $200 for internet, and even more if you want carpet, plants, etc. This doesn’t include airfares, hotels, car rentals, and shipping costs. It’s crazy expensive and makes breaking even almost impossible — unless you’re selling expensive “designer” speaker cables, interconnects, or power cords! Yep, all attendees will receive a discount of 25% off the paperback book and accompanying Blu-ray disc. What a deal. In the interest of all readers that can’t be in Chicago next weekend, I’ll make the same discount offer. 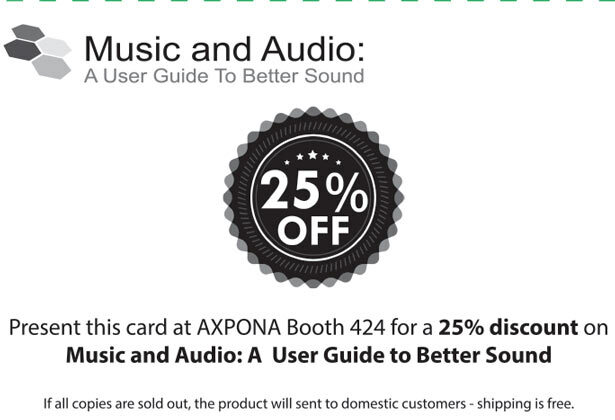 Use the coupon code AXPONA 2018 when you check out of the Music and Audio: A User Guide to Better Sound website and the discount will be applied. BTW, I was recently interviewed by Carlo Lo Raso of Secrets of Home Theater & HiFi magazine for a featured piece in April. I’ll let you know when it’s posted on their site. Carlo enjoyed the book and said, “Positively outstanding! As an audio hobbyist, this is the first book that I’ve come across that lays out so much technical and practical audio knowledge in such an approachable manner.” Thanks Carlo! This year will be different. AIX Records will be in the marketplace at Booth 424. 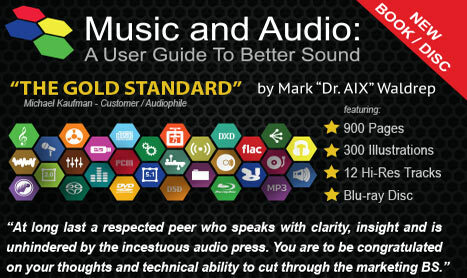 I’ll have the usual assortment of AIX Records DVD-Audio/Video and Blu-ray music productions and plenty of copies of the new “Music and Audio: A User Guide to Better Sound” book. In addition, I shipped a shiny new YARRA 3DX surround sound bar to Chicago and will be demonstrating the amazing ability of this technology to reproduce immersive 3D sound without headphones or multiple speakers. The crowd sourcing campaigns for the YARRA 3DX have raised over $1 million since the launch in September. The company plans to begin shipments during the second quarter. If you’re interested, discounts are still available at the YARRA 3DX Indiegogo page. I’m convinced that sound field modeling will have a large impact on high-end audio in the near future. Why spend crazy money on expensive headphones or speakers when all you really want is great fidelity to reach your ears. How it gets there is actually less important. 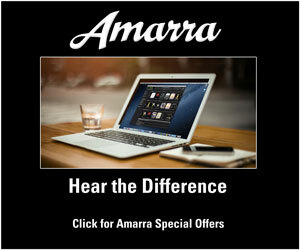 You can visit the YARRA 3DX website for additional information the technology. 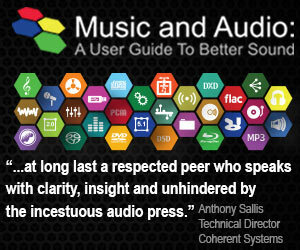 The audio world is changing. I just read the announcement that Oppo has decided to cease designing and manufacturing optical disc players. Does this mean that high-end audio enthusiasts will have to retreat to Tidal (with or without MQA) or Spotify? I’ll be addressing these and other issues in future posts. 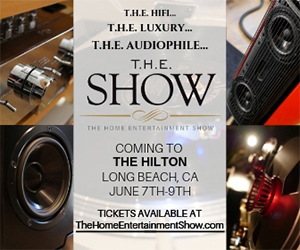 For those unable to visit Chicago, I’ll be exhibiting at the Los Angeles Audio Show in June and the California Audio Show in July. I’m also considering a road trip to promote the book. If you’re a member of an audiophile society and would be interested in hosting a visit by yours truly, please let me know. I can’t promise anything at this point but it’s worth putting out some feelers. Charlie and I would love to come to your town. Whilst it’s unfortunate about what’s happened to Oppo, optical disk spinners are not necessary any more. I can take a BD disk, rip it, do any necessary demultiplexing and downconvert, if required. I can play the resultant file on either a PC or any number of high quality playback devices. I guess physical media is really dying, with Oppo getting out of their old bread-and-butter business. While I do certainly love my BDP105-D and playing the amazing variety of disc media that it can handle, I also enjoy playing downloaded music through it. One thing I hope Oppo intends to do is make a preamp-processor. 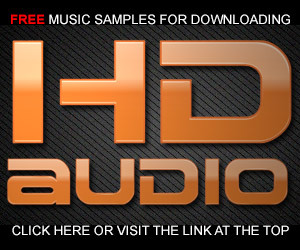 They have, as far as my experience has shown me, the best audio processing around. They could do a heck of a job with a project like that, and with their reputation, I’d dump my Marantz 7700 in a heartbeat. Good alternative to Oppo BR ? If discs are still a big part of your system, then I wouldn’t hesitate purchasing a used Oppo player – either a BDP 95, 105, or 205. They are very good machines and sound wonderful. Otherwise, a new machine from Denon would be my next choice. So, I am just about to finish experimenting with the CD format and here are the results: 400 nanoseconds rise/fall times [that’s enough for anyone of human race], crystal-clear low detail and full highs, -160 dB noise floor. The sound is approx. live, but it seems that might come at the expense of slightly harsher sound [digital sound already had been considered as harsh by some] due to reconstruction filter being absolute necessity [that stepped digital waveform must be eliminated in any way], however though, the settings could be such as in Watts’ DAC64, but then again, this will destruct 22.05…~20kHz frequencies [no problem here by the way], but it would be rather preferable to retain the near-perfect phase characteristic while still no ringing heard. If CDs do the trick for you, then great. I am happier in the knowledge that all of the ultrasonics frequencies and dynamic range in my recordings (and in real life) are accurately reproduced. If it’s so easy to move up to high-resolution, why not? Sorry, I hit the post comment, before posting it. You make it sound like Oppo makes the only disc player for audiophiles. It will have more of an effect on video and home theater fans, as it offered a very good value for DVDs and Blu-rays. There are many CD players still available, and although usually at a higher price SACD players. I haven’t heard their latest players where I could evaluate them, but CDs played through my PS Audio PWT transport, into a Lindemann 825 DAC sound better than SACDs played through my Oppo 83se, as they should, as it costs 14 times as much. My point is although Oppo will be missed, and made great value players, they were more at home in a budget system when used for audio. Or as a starting point using their optical drives to develop a high end transport that could output DSD from a SACD to a DAC that could accept the required handshake, using a HDMI or a proprietary cable to output I2S.. The Oppo machines are the only ones that I would ever consider…because of the price performance factor. I have a Meridian DVD-Audio player and Processor (thanks to the generosity of Robert Stuart) in my rack and the sound amazing…but not $30K worth of amazing. I would never recommend anyone purchase a CD player…why cut yourself off from the enhancements of high-resolution? The Oppo line of high-end players were budget price but audiophile quality. I would put the sound up there with anything from PS Audio. As for DSD and SACD, I don’t understand the attraction for an encoding methodology that is highly flawed. Stick with high-resolution like 99% of professional audio people. Not even to someone who owns a large CD collection? Most DACs, and a lot of CD players include digital inputs, able to process hi-res PCM. You have obviously never heard PS Audio’s current transport and Directstream DACs, no slight meant to Oppo, as it is an excellent value, but it is a budget player. 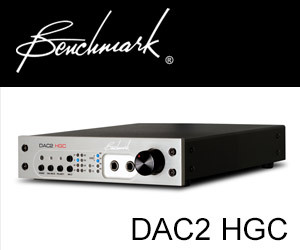 How does it compare to your beloved Benchmark Dac2? The current Oppo’s have digital inputs, are they as good as the the Benchmark? Paul and his team make great high-end audio equipment and so does John Siau and Benchmark. I’m partial to the Benchmark products because I see them in professional studios and mastering rooms. I just can’t imagine anyone purchasing a CD player — even with digital inputs — when you can get better conversion from a unit like the Oppo machines. I know the PS Audio Directstream DACs. I’ve been and visited Paul in Boulder. I find their gear to be pricey but very good…I’ve owned some of their equipment in the past. The word “budget” seems to be a slight in your mind. I think the DACs in the Oppo machines can compete with the sound of any onboard DACs and without the high price. I would like to comment on your book and dvds just received ( I was abroad when it arrived. ) It is obviously a professional and a worthwhile project. This is obvious from just browsing a few chapters, I have not played the dvds through my Oppo and into my stereo rig. There are some fundamental things I disagree with because my own and my friend’s experiences contradict several of your absolute statements but that’s ok. However, what is really irksome is that every few pages – and sometimes more often – there are glaring typos and grammatical mistakes. Insufficient time to proof read it ? Proof read by a computer ? Too expensive ? Sorry but it shows a lack of attention to details and a laissez faire attitude that is not worthy of the content. Shame. I would have proof read the whole book and corrected the mistakes for free and still bought the thing. And really it would not have taken that long ! David, thanks for your comment. I would be interested in the items you would argue about — maybe DSD or cables? I apologize for any typo or grammatical problems. My Fulbright scholar and MIT graduate son, handled the initial proofing and while he caught a lot of problems, obviously between us many remain. I’m happy to receive any errata lists and am already incorporating those that others have found. It’s a major challenge to shift through 900 pages and there was pressure to get it out. Regarding your assistance to High End audio shows, here’s a thought: how about crowd-funding? Ask your readers upon an upcoming event to contribute to your presence with the full 5.1 equipment compliment, so they may experience it at the show. If enough support is provided then you can attend, if not then you can issue the contributors a refund. This is common with trade and public shows now. The biggest issue for the exhibitors is what are they really gaining out of it. Certainly very rarely is it money to recover immediate costs and huge time commitment is never recovered. You can’t rely on the Audio press to give you a mention. In the 3 shows I’ve exhibited in(10 years ago) I always came away somewhat disillusioned and in the end gave up. I suspect these shows will disappear for the small dedicated Hi-Fi fraternity. CES showed this to be the case this year. Unless you have a mass market digital product don’t bother. These shows have been in decline for some time in my view. I don’t think we have seen the last of “Oppo” yet. The 205 is excellent. The Sabre 9038 chips do easily beat the 9018 chips. I did own a Benchmark Dac 2, this has been replaced with the Oppo 205 in my system. I know longer felt the Dac 3(9028 chips) was value for money up against the 205. As Mark reiterates the Oppo can’t be beaten on this count. OPPO is considering one final manufacturing run for the UDP-205. If you are interested you can register on the OPPO web site. The best price on Amazon at this time for a new UDP-205 is $3499. At least it’s not a budget player anymore. Currious to know how the Axpona went for you especially your Friday afternoon panel. I was not able to attend the show this year and would have wanted to hear from you during the discussion.